God’s Word is a powerful tool! When His people take the time to deliver His Word to others, God can work in mighty ways. Not many people would think to make that delivery during a bike ride. But David B. of Norwalk, CT, who runs a chapter of Christian Cycling, saw his regular rides as an opportunity. Watch as David explains exactly how he uses the Gospel while he’s out cycling. David saw the challenge of handing out the Gospel while people were actively cycling. But he loves God’s Word so much that he looked for a way to use the moments God had given him. How did David overcome this challenge? He found The Pocket Testament League’s Gospels of John and fell in love! The pocket-sized book was the perfect fit for his situation—easy to carry, easy to share. But David knew his situation was unique. He also wanted to give cyclers a way to get in touch with him personally. That’s when David discovered he could create his own custom pocket Gospels. 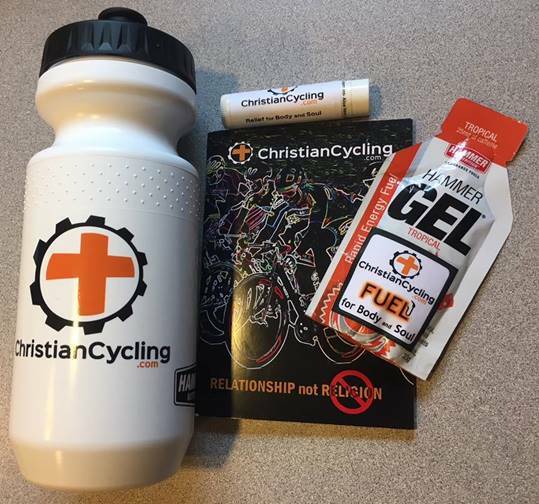 Christian Cycling Custom Gospel gift pack. Not only was David able to fill the need of sharing the Gospel with his cycling community, but he could also capture attention with a custom cover with a personal message from David inside. David saw the opportunity to use the Gospel in a powerful way, and through David and his partnership with The League, he’s given out many Gospels to unexpected cyclers! Did you know that anyone can customize Gospels? We have many leaders who partner with The League to customize Gospels for their business or ministry. But like David, you too can hand out Gospels customized for your situation. Such a direct message has a powerful effect on those who receive them. Together, let’s start a beautiful partnership for redeeming lives with the Gospel in your community.